iPhone 8 is the most talked upcoming smartphone in the market, all though the device is expected to come in the market somewhere in the month of October 2017 (as per the past released schedule of Apple). Internet is going crazy with the leaks and rumors about the device. As per the recent leaks and information available online, iPhone 8 is expected to feature some of the cool features, as it is going to be 10th anniversary iPhone. It is also expected that new A11 processor will have some of the exceptional features to support. Yes, the upcoming A11 processor looks pretty darn fast, and it's nice that we'll probably finally get wireless charging, but what is going to compel iPhone fans perfectly happy with their handsets to upgrade? Patently Apple has unearthed a slew of patents awarded to Apple related to the iPhone and a new feature that could turn the iPhone 8 (or another future iPhone) into a Kinect-like device. The first key patent relates to an edge-to-edge display, which would finally get rid of the bulky bezels around the iPhone. This lines up with other iPhone 8 rumors and reports. The patent covers "bending one or more edges of a touch sensor panel and/or a display panel of an electronic device to reduce the non-interactive border area." As Patently Apple notes, this is done to enable the touch area to extend to the edge of the device while reducing the overall width. In other words, you should expect a bigger screen in a smaller area, similar to the Galaxy S8. The second patent deals with "a finger biometric sensor carried by the touch display." Translation: you should expect to see Touch ID functionality integrated directly into the screen on the iPhone 8. There have been some reports that Apple wouldn't be able to pull this off in time, which would result in a back-mounted fingerprint sensor, but we're seeing more signs recently that integrated Touch ID is happening. 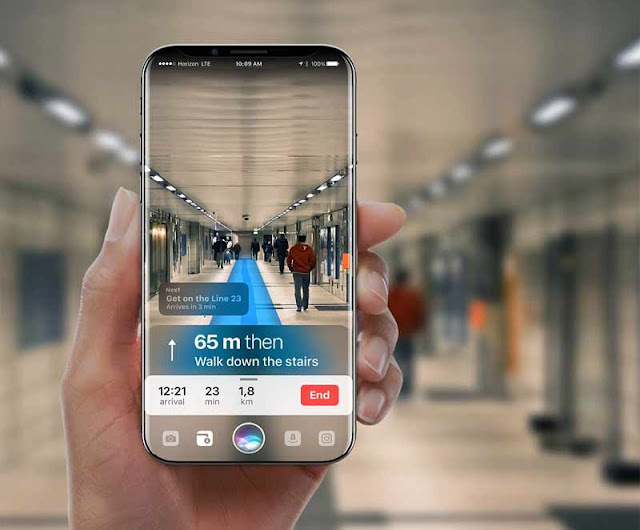 The last patent likely won't be realized in time for the iPhone 8, but it could be a very interesting application related to the 3D camera and sensors we've been hearing about. The patent covers "methods and devices for projection and capture of optical radiation," according to Patently Apple. That's a mouthful, but the gist is that Apple could be working on a "portable Kinect-like device so that users can interact with games or exercise videos play on a computer or Apple TV." What we don't know is whether Apple hopes to put this sort of functionality inside an iPhone, is working on a dedicated piece of hardware or is just dreaming up a concept that could be turned into a product.